In addition to providing advisory along with custom consultancy services, StorageIO publishes Industry Trends Perspectives reports, white papers along with solution briefs. These resources are in addition to regular blog postings, twitter tweets @storageio, articles, tips, and FAQs. View additional content including videos, pod casts and webinars here along with in person speaking or keynote events here. See global press mentions, industry trends perspectives, commentary interviews in the news page. Refer to our disclosure page for information about disclosure and related policies pertaining to Sponsored or Commissioned content. This Server StorageIO Industry Trends Perspective report looks at common issues, trends, and how to address different application server storage I/O challenges. In this report, we look at WekaIO Matrix, an elastic, flexible, highly-scalable easy to use (and manage) software-defined (e.g. software-based) storage solution. WekaIO Matrix enables flexible elastic scaling with stability and without compromise. Read more in this StorageIO Industry Trends and Perspective (ITP) Report compliments of WekaIO. Hardcover hardcopy as well as electronic versions available via various global venues (Learn more and order your copy here). Hardcover and ebook versions (Kindle, PDF via bookdepository.com, and CRCnetBase, 370 pages, 15 chapters, appendices and glossary, over 100 illustrations figures and tables. Available at Amazon.com and other venues around the world. The book supplies real-world perspectives, tips, recommendations, figures, and diagrams on creating an efficient, flexible and optimized IT service delivery infrastructures to support demand without compromising quality of service (QoS) in a cost-effective manner. Cloud and Virtual Data Storage Networking looks at converging IT resources and management technologies to facilitate efficient and effective delivery of information services, including enabling information factories. Schulz guides readers of all experience levels through various technologies and techniques available to them for enabling efficient information services. This book explains when, where, with what, and how to leverage cloud, virtual, and data storage networking as part of an IT infrastructure today and in the future. Cloud and Virtual Data Storage Networking comprehensively covers IT data storage networking infrastructures, including public, private and hybrid cloud, managed services, virtualization, and traditional IT environments. The Green and Virtual Data Center examines issues and opportunities for enabling efficient, effective, optimized, economical and productive IT data centers for business sustainability with a by product of helping the environment. Addressing multiple technology domains and disciplines, this book looks at design and implementation tradeoffs using various best practices and technologies to sustain application and business growth while maximizing IT resources, such as power, cooling, floor space, storage, server performance, and network capacity along with management software tools. Hardware and software defined content solutions - Fast applications need fast servers, storage and I/O resources. Recently I had the opportunity by Servers Direct to get some hands-on test time with one of their 2U Content Solution platforms. Content solutions span from video (4K, HD and legacy streaming, pre-/post-production and editing), audio, imaging (photo, seismic, energy, healthcare, etc.) to security surveillance (including Intelligent Video Surveillance [ISV] as well as Intelligence Surveillance and Reconnaissance [ISR]). Read more about content solution platforms including those Intel powered systems from Serves Direct in this Server StorageIO industry trends perspective solutoin brief. September 2013 - Data Dynamics StorageX 7.0 Intelligent Policy Based File Data Migration - There is no such thing as a data or information recession . Likewise, people and data are living longer as well as getting larger . These span various use cases from traditional to personal or at work productivity. From little to big data content, collaboration including file or document sharing to rich media applications all of which are leveraging unstructured data. For example, email, word processing back-office documents, web and text files, presentations (e.g. PowerPoint), photos, audio and video among others. These macro trends result in the continued growth of unstructured Network Attached Storage (NAS) file data. Thus, a common theme is adding management including automated data movement and migration to implement structure around unstructured NAS file data. More than a data mover or storage migration tool, Data Dynamics StorageX is a software platform for adding storage management structure around unstructured local and distributed NAS file data. This includes heterogeneous vendor support across different storage system, protocols and tools including Windows CIFS and Unix/Linux NFS. March 2011 - Removing organizational barriers for leveraging technology convergence - In some cases convergence can address ease of acquisition or product selection while in others its doing more with less, stretching budgets, consolidating or enabling new functionality. Another consideration before a convergence technology is deployed is how organizational processes, best practices and staffing are aligned to support a given technology. For some organizations the journey to convergence is well underway while for others the technology may be in motion but leveraging it to its full potential still a distance goal. For example a converged network switch is installed but is still being used as either a LAN or SAN box managed by either the network or storage group. March 2011 - Business and technology benefits of converged I/O networking infrastructures - A form of innovation is the use of converged technologies that enable the reduction of complexity and, subsequently, cost from information services delivery. As an example, converged I/O and networking technology brings together the best of traditional server and storage I/O connectivity with LAN networking. The business challenge that converged I/O network addresses is to remove complexity from a technology as well as from management and acquisitions perspective. Complexity adds cost by supporting multiple technologies that should be complimentary but are often leveraged to perform similar functions. December 2010 - SANpulse Technologies Migration Practice Solution Brief - Large organizations with multiple data centers, perhaps located in different countries around the world, are faced with the recurring and perpetual task of moving or migrating data. This data migration can be in support of planned technology upgrades or refreshes, changes in suppliers, or retiering for optimization and consolidation. A smart data migration software-led solution should reduce the amount of time, errors and complexity associated with data migration. A smart data migration solution is comprised of experienced people and software-led technology to provide automation, proven processes, best practices and an active knowledge base that can be transferred to provide ongoing value. December 2009 - Improving IT Resource Effectiveness: Reducing Storage Costs with Situational Awareness and Automation - As an IT decision maker in charge of infrastructure resource management1 (IRM), you are in a squeeze play. On one side are shrinking budgets, on the other business demands to process, move and store more data. Thus, the need is to do more with what you have in a given footprint constraint. That is, boost resource usage and service delivery within your capital and operating budget, available staffing, time windows, as well as service requirements, regulatory, power, cooling and energy efficiency among other Green IT (efficient, effective, productive) or infrastructure optimization objectives. Shift focus from cost cutting to reducing per unit expense of IT resources (hardware, software, facilities, people) without negatively impacting service delivery experience. September 2008 - Application Transparency and Co-existence with Real-Time Data Compression - Organizations of all size and applications type, including high-performance file serving and databases with changing data, can realize the benefits of a reduced data footprint using real-time compression. September 2008 - Enabling a Green and Energy Efficient Storage with Real-time Compression - For environments looking to address power, cooling, floor space and environmental (PCFE) Green footprint issues, a data footprint reduction strategy across different applications and data types including on-line and off-line data should be adopted as part of a PCFE strategy. July 2008 - Real-time Data Compression Integrity and Reliability - This brief looks at how loss less Lempel-Ziv (LZ) type real-time data compression provides data integrity while reducing data footprint for on-line active NAS primary storage. LZ compression is a proven technique for data footprint reduction that scales with stability as more data is ingested without introducing performance bottlenecks during writes (compressing) or reads (un-compress). July 2008 - Real-Time Data Compression Performance Considerations - This industry trends and perspective solution brief looks at performance considerations and impacts of real-time data compression for active data on-line primary NAS storage as part of a organization wide, application independent data footprint reduction strategy. July 2008 - Real-time Data Compression for On-line Active Data - For organizations wanting to address power, cooling, footprint and environmental (PCFE) issues, a holistic data footprint reduction strategy should be pursued. A data footprint strategy should include real-time data compression of changing and static on-line data while using de-duplication of recurring backup data and archive for in-active data. This solution brief looks at how and where real-time data compression of active on-line data, including primary NAS and secondary storage, can be used to achieve data footprint reduction benefits across a wide range of applications in organizations of all sizes. April 2008 - Fibre Channel over Ethernet (FCoE) - If you have not yet heard of the emerging Fibre Channel over Ethernet (FCoE) technology or one of the vendor marketing terms including Data Center Ethernet (DCE), I/O Virtualization (IOV), Converged Network Architecture (CAN) or Data Center Fabrics leveraging a hybrid premium Ethernet with low latency and Quality of Service (QoS), rest assured, you will soon. This StorageIO Industry Trends and Perspective looks at what FCoE is, why it is important to be aware of and where it may fit in your environment in the future. December 2006 - Decrypting Enterprise Storage Security: A look at enterprise storage system security strategies, options and issues for data at rest and in-flight. - Data security, encryption, key management, security strategy, aligning technology to specific needs and requirements. December 2006 - Addressing Storage Management Challenges: A look at addressing storage and data management challenges using ultra scalable NAS - Data and storage management challenges, point-in-time (pit) snapshot copy, iSCSI, virtualization, ultra scalable NAS, iSCSI, high performance, clustered storage, replication, thin provisioning, policy based automated data migration. 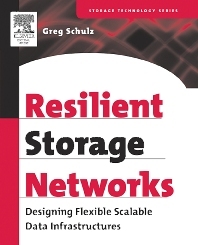 Resilient Storage Networks looks at storage and storage networking from a technology, and vendor neutral standpoint including coverage or performance, capacity planning, security, design, topologies and scaling, local and wide area, lifecycle management and data access among other topics.